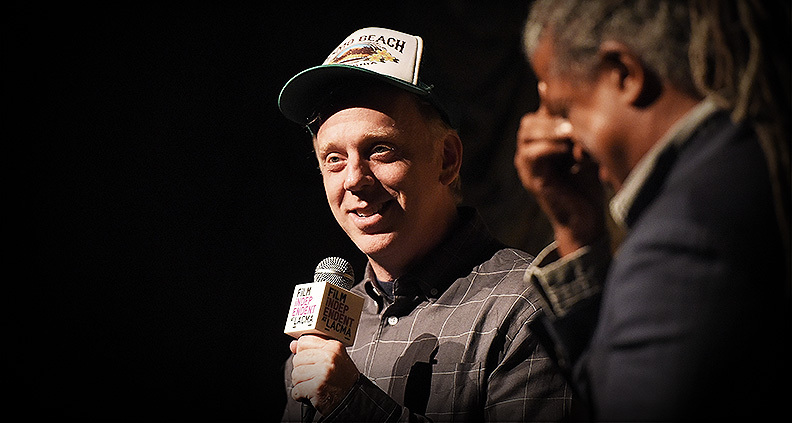 On September 14, Film Independent at LACMA hosted a screening of Brad’s Status, the new film written and directed by two-time Film Independent Spirit Award winner Mike White (The Good Girl, Chuck and Buck). The comedy-drama stars Ben Stiller as Brad Sloan, a successful non-profit executive struggling with debilitating insecurity, as he compares his life to those of his successful old college friends online. The satirical film provoked plenty of audience laughter, yet was disconcertingly relatable. 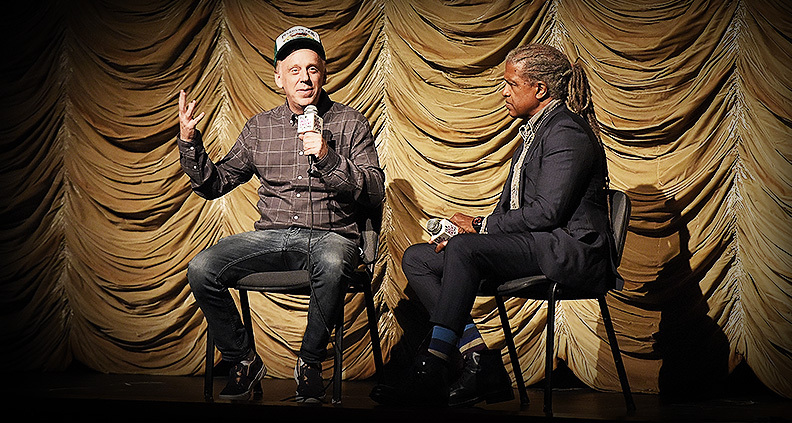 Following the screening, Film Independent at LACMA curator Elvis Mitchell sat down for a humorous conversation with White to discuss the process of making the film and what he feels it says about how people judge themselves in the age of the internet. The story focuses on the comparisons Stiller’s Brad makes between himself and others—wondering if, at age 47, he’s as happy and successful as he should be. Married to wife Melanie (Jenna Fischer), Brad is getting ready to send son Troy (Austin Abrams) off to college in New England. White stressed that the film wasn’t an autobiography. Nevertheless, he definitely relates to the anxiety and “ruminating conscience” that Brad suffers from—as well as the constant self-doubt inflicted by social media. Though White wrote the script without a specific actor in mind, he was certainly pleased to snag Stiller. Mitchell observed that the role could have easily been written specifically with the actor in mind. White said he enjoys writing films that aren’t necessarily based on his own life, but that consist of some of the experiences he’s gone through. In one scene, Brad confesses his anxieties to a passionate young Harvard student. As the scene carries on, the student is seen slowly becoming disinterested, ultimately telling Brad she doesn’t feel sorry for his “privileged” problems. White shared a post-screening experience where an audience member said something similar to him. He stressed that the film is meant to be about the character’s feeling of inferiority, and how social media is often be the culprit. Much of the film consists of voiceovers that portray the experience of being inside Brad’s head, giving a sense of the overthinking that occurs when people are doubtful. The director shared that he wasn’t much of a fan of letting voiceover tell the story, but for this film he felt it was important to show what Brad was thinking—the voice in his head contributes to his insecurity. Discussing the film’s final scene, White said he was especially pleased to find the climactic piece of classical music because he felt the piece’s orchestral progression went well with the epiphany that Brad was having at that moment. Mark Mothersbaugh, the film’s composer, worked with White in adapting Antonin Dvorak’s piece “Humoresque.” White said there’s a certain anxiety that can be felt during the buildup of the flute and violin played in the film—eventually leading to Brad’s cathartic emotional moment. White posited that when we put ourselves fully into experiencing what our own lives have to offer, we can discover what’s most important to us, and that that doesn’t need to be compared to anyone else’s experience. Brad’s Status demonstrates how the inconsistency in people’s self-perception is tied to the technology we use and that which we value. Not a bad observation for a comedy. Brad’s Status is currently in theaters. To learn more, please visit (ironically) the film’s Facebook page. To see what’s coming up at Film Independent at LACMA, click here. And learn how to become a Member of Film Independent by clicking here.